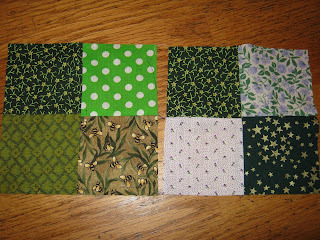 Here are the four patches I will talk about at the end of the post....o.k. bloggers. 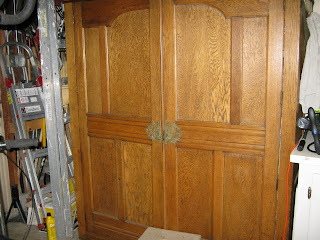 I decided to add this picture to the end of the blog, but couldn't move it. Then....I tried to delete, but don't know how. So friends, are these typical problems? Inquiring minds want to know. Yes, I've taken over the dining room. I have also stashed fabric on the chairs, so that you can't see it. 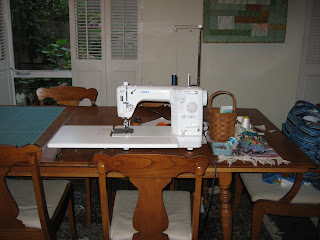 Maybe someday I'll put a picture on my blog of my dining room table set for dinner with a beautiful quilty tablecloth on it....one can dream, right? 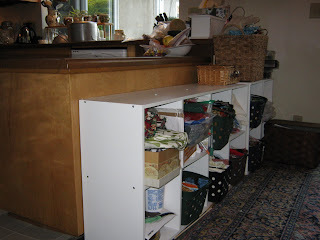 Turn around and you can see I've even added a short little bookshelf to keep all those little things like fat quarters, thread, scissors, and the list goes on. I sure didn't clean up much for these photos. (the white bookshelf did have more stuff on the top, but I cleaned it off). This is where the treasure is! But I won't open it tonight. I looked at it thinking I MIGHT open it for my blog....but couldn't face the music. This monstrosity was purchased for a few dollars at a neighbor's yard sale and it sits in my garage. Whenever I need some fabric I go shopping out here. Many of you use closets in the house, but my bedrooms are FULL of children, so I haven't been able to take them over YET. My daughter made some four patches a couple of years ago (see the top of the post) with some scraps she liked. But after making A LOT of blocks, she lost interest or got discouraged. I took those blocks and put this quilt together for her....it was a team effort. Didn't she choose some fun fabric? 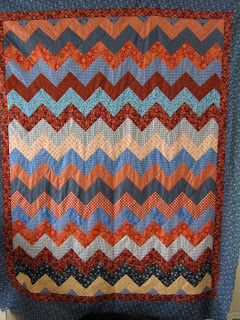 I had fun making this quilt and am happy we finished it for her. 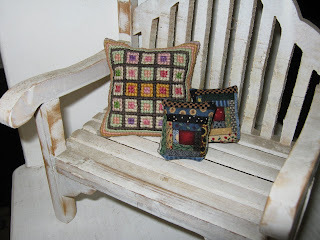 After finishing my little christmas project yesterday, I had these little scraps left over. 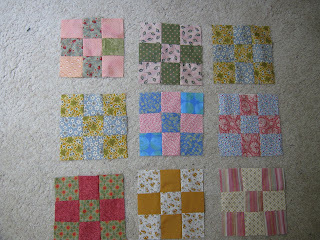 I COULD NOT throw them out, even though most of them are only 1 1/2" wide and this is ALL I have left. I certainly can't make a quilt out of these. Then I remembered a lonely pillow near my front door. I found this small needlepoint pillow at a rummage sale Y-e-a-r-s ago. Maybe it would finally like some company. ?? 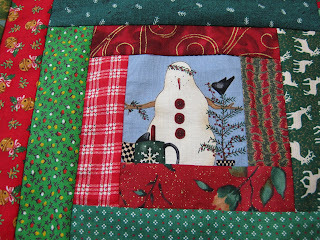 I'm having fun quilting along with other quilters in blogland. Here are my two projects. 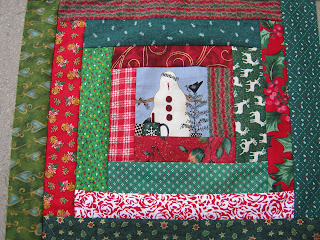 The first is a 9 patch from a quilt along with crazy mom quilts, Amandajean. 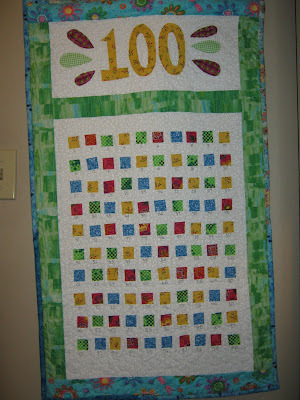 Everyone is supposed to make one 9-patch every day for 70 days. Actually I can't remember right now how many days - I know it's a lot! So-o-o I'm on schedule so far. Yeah! 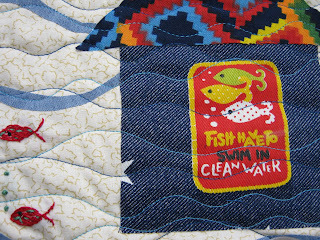 There will be some fun pictures on flikr of all the quilts people make. 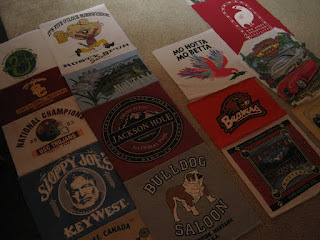 Here is my t-shirt quilt. Almost done. 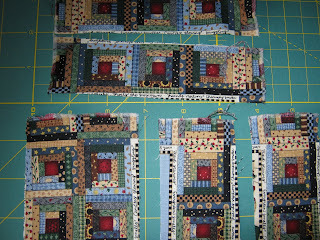 Tomorrow I hope to quilt and bind. I like the way the half-square triangles look around the outside. AND I'm so surprised it turned out almost exactly square...it sure wasn't planned that well. I needed to add one small piece of blue up in the left corner. I was able to go to the Long Beach quilt show today. 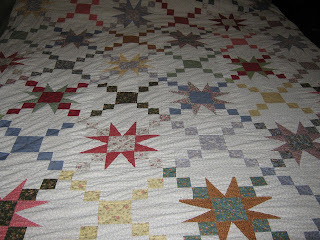 Here is just a glimpse of three beautiful quilts I saw there. I was also able to SHOP! this bag here is full of treasure. 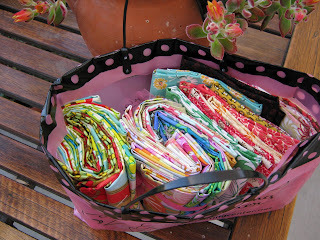 I will be dreaming about the perfect quilt or quilts to use with this fabric. Believe it or not this shop was the only one I shopped at today...but I thought the selection was great and the price was RIGHT. 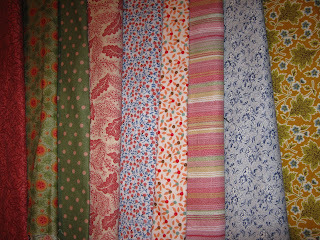 While I was looking at this fabric I heard someone talking about blogs...I interupted the conversation with these Strangers and found out that they were some of my blogging heros! Julie, from jaybirdquilts and Alissa from handmadebyalissa greeted me and told me it was just fine to interupt other bloggers when they're talking. :) Hope I made a good impression and they will help me with all my blogging issues. 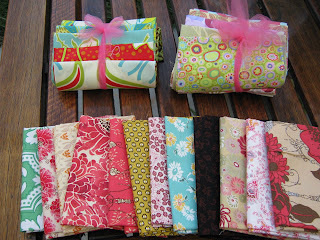 I love these fabrics...can't wait to get going making that PERFECT quilt! 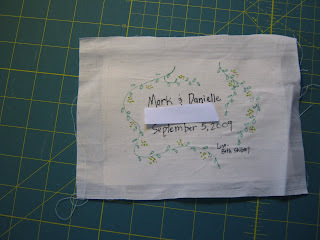 Everytime I finish a quilt I TRY to sew a small label on it. This is my label KIT. 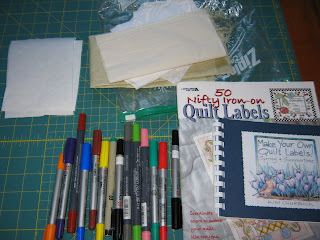 It includes: small pieces of wax paper (that can be used a few times), small pieces of white or off-white fabric, fabric pens and two books that I use for inspiration. 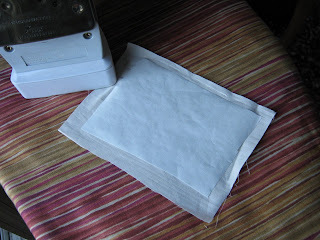 First, I iron a piece of wax paper on the back of the fabric. 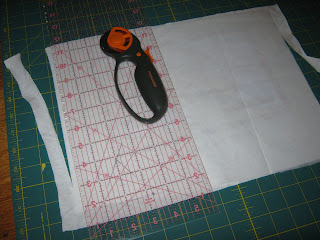 This helps steady the fabric while I write the words and draw my little picture. After my picture and message are complete I turn the edges under and whip-stitch it on. 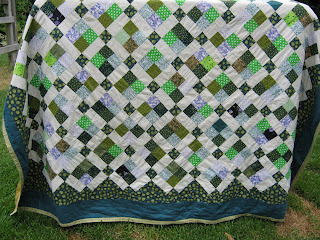 This quilt is the hexagon that I finished a couple of weeks ago. Why did I wait until the night before giving it away to make the label? i used an apron a while back at work. i sometimes substitute teach at a school for handicapped adults. the class i was in that day was a home living skills class. 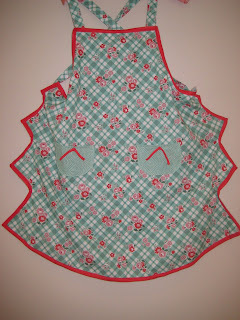 so-o-o i wore that apron. it was old. a real classic. AND i loved it. i thought about that apron. and i thought some more. 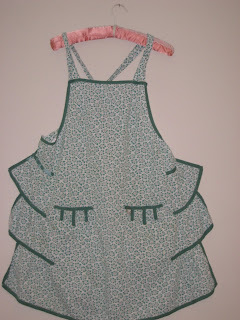 how could i have that apron? well, the teacher let me borrow the apron and this is what i came up with....the new is good, but old one has something i couldn't duplicate. i'm not sure what it is. the texture of the cotton after so many washings? 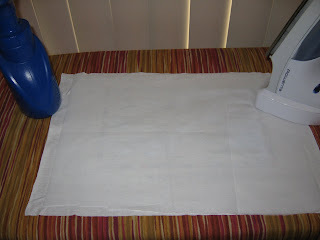 supplies: about 15 - 20 t-shirts, fusible interfacing, extra fabric for border, backing and binding. 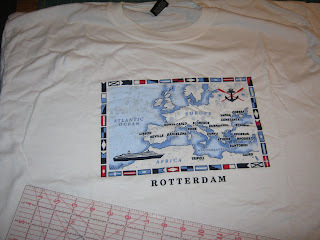 Here's my shirt ready to cut. (Is it hard for you to cut a nice shirt?). My widest picture was about 14", so i will cut it 15" wide or so. I want all my pictures to be 14" wide when I'm done. Cut through all layers - it's easier that way. About 15" wide and ANY SIZE top to bottom. 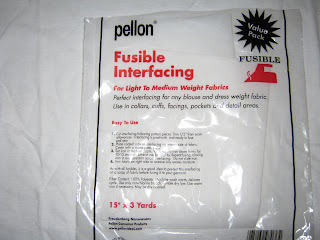 Use pellon (fusible interfacing) in a bag or some that has been sealed. I bought some at a reduced price on the bolt and it did not stick at all. 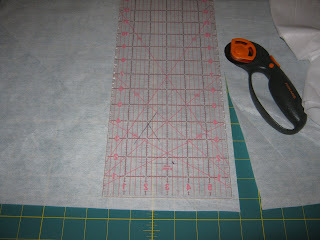 Cut your pellon 14" wide and then fit it to the size of your shirt's picture height. Lay pellon on back of shirt picture. pellon will be a little smaller. 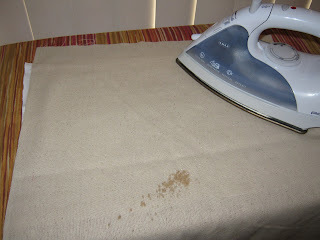 this helps because the t-shirt fabric tends to roll at the edges. 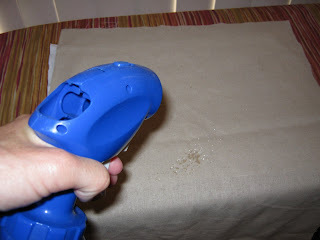 Use a pressing cloth and water bottle to press. Follow manufacturers directions. 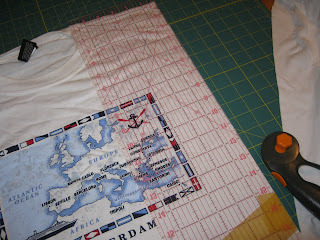 Now trim the t-shirt at the edge of your adhered pellon - remember it's 14" wide, any size height. VIOla! We're getting somewhere, but all my rows are different lengths. 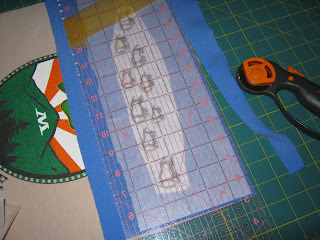 I will be adding pieces of fun fabric to each row after measuring them. I want them all to be the same length before finishing this, right? 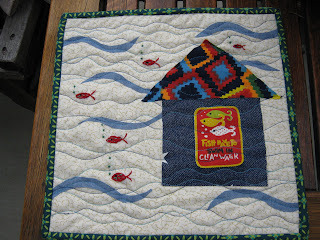 This quilt goes to my neighbor who is a true "big brother" to my son. It's so nice to have those other adults in your children's lives. They're the ones that inspire our kids and really help us in our years of child-rearing. 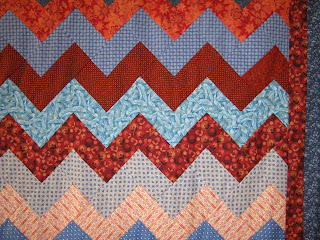 I finished my zig zag quilt yesterday. The boy who will be getting this said he liked orange and blue.....so orange and blue it is! 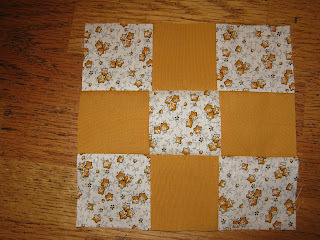 i have seen this quilt a few places here in "blog-land" and know that bee square fabrics has a tutorial. Just wish I would have read the directions more carefully. instead of using the same fabric every other row i used different ones. This meant it was little more tricky to make....but i had fabric cut and couldn't let it go to waste, could I? 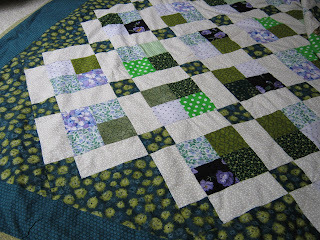 i still need to quilt this, but am going to wait until it cools off here. 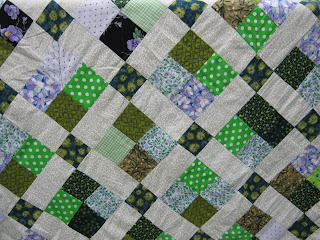 i started today thinking about a new quilt-a-long that crazy mom will begin again on monday. yeah! 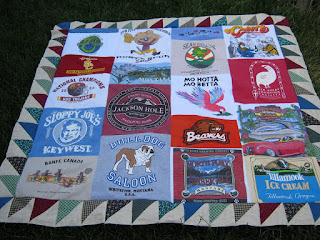 i'm trying to figure this blog-quilt-thing and finally feel like i have a handle on some of the many intricacies of this big SUB-CULTURE called "quilters". The decision today - "what fabric am i going to use?" HUGE decision. right? so i went shopping in my garage and came up with a few fabric choices. I also made one block. Oh no! do i have to wait until monday to begin? 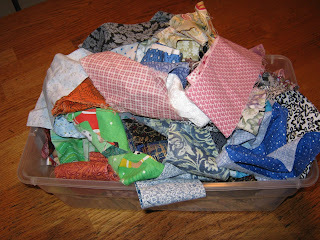 I have some small pieces of fabric, but i also have a small box full of 2 1/2" strips i may dig into as i go. 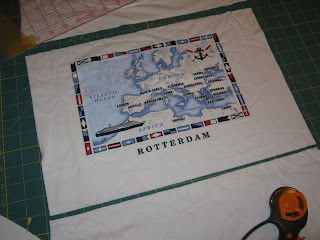 i'm sure looking forward to seeing what other quilters will come up with on this project...so fun! My solution to time out and the 100's chart - make a quilt! My little girl gets an opportunity every so often to "go to your room and count to 20". As she grows the number will grow and it's already there on the wall! My older kids also had to "go count to 100", but their chart was a long piece of paper tacked to the wall close to the ceiling. As they got older, the number line morphed into "go do your 3 times tables" (3x1=3, 3x2=6, etc.). I get a little break to calm my nerves and I foolishly (?) think they might be using their BRAINS. 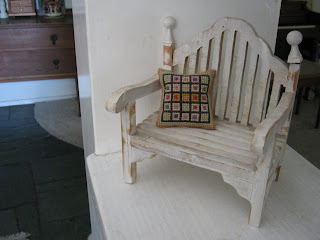 I used iron-on fabric adhesive, cut little squares, ironed them on and quilted over everything! I then used a fabric pen and wrote the numbers under each little block. 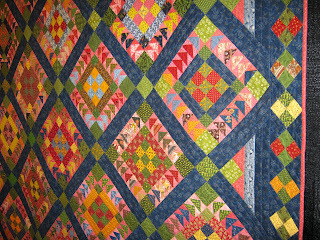 The quilt exhibit is called breaking traditions art quilt exhibit being held in Novi, Michigan Sept. 25-27. 2009. I finally finished my husband's new quilt yesterday - the day before he left on a LONG trip. I learned a lot of things making it. I learned I need to s-l-o-w down, measure, s-l-0-w down, measure, over and over again. 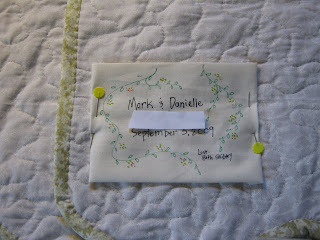 I also learned that those dark fabrics really do show through the white fabrics. 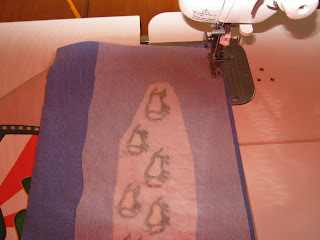 I will be more careful to iron the seams towards the dark fabric next time. 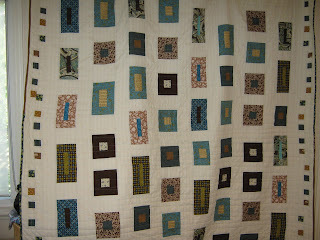 I machine quilted this in long straight lines across the quilt. 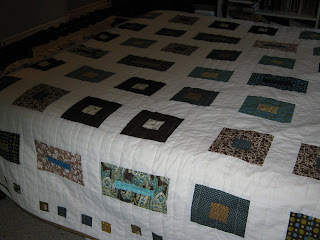 I like the look of the quilt and my husband says he does too...yeah! 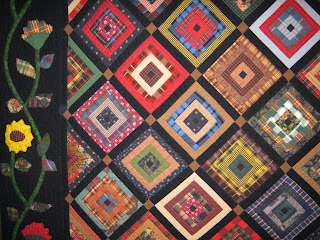 At the beginning of this year I was dreaming about maybe going to an outdoor quilt show in Sisters, Oregon. It's a pretty well known show in the quilting world. 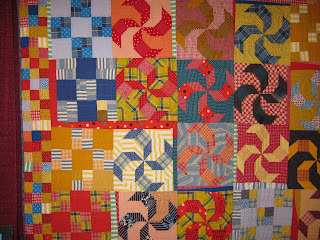 They have a quilt challenge and I began the quilt in Jan. or Feb., not knowing if I would go to the show...but wouldn't it be fun to have a quilt hanging there if I did? I finished the quilt. While waiting to enter the outdoor show in July, I entered it into a local art show and won a first place ribbon! There weren't many entrants in my category, but it was still very exciting.